Looting Matters celebrated its third birthday earlier this month. How many people read Looting Matters? Putting aside those who drop in via the web (and many just come to the "home page" and read the recent posts), there are some who use the RSS feed. 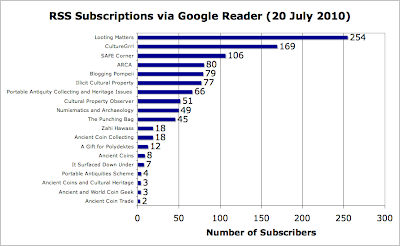 At the moment there are 254 subscribers via the RSS feed on Google Reader and that means that in June (for example) over 7000 posts were delivered to electronic desktops. (And that includes the iPad!) In addition a number of people get the posts via email. 254 RSS subscriptions is small when I look at the Oxford Dictionary of National Biography (659). So I had a look at the figures for some of the people writing about "cultural property" in the widest sense. 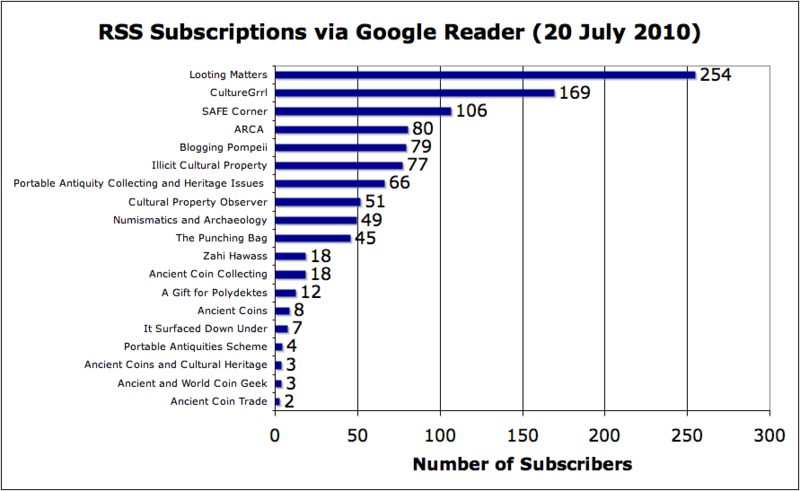 I was particularly surprised to see Zahi Hawass receiving such a low readership. I leave it for others to draw conclusions about these figures. I think this suggests that Looting Matters has a very solid readership and I am grateful for their support (and contributions).